Where Was London's First Pizza Restaurant? Sejal Sukhadwala Where Was London's First Pizza Restaurant? A trendy pizzeria opens in Soho, with a mostly young, arty clientele. Its Sicilian pizzaiolo rolls out the pizzas in full view of diners, tossing the dough high and theatrically into the air. She tops each with local, London-made mozzarella, before placing them in an oven bought from Italy. London's latest artisanal pizza restaurant? Nope, this is Pizza Express in 1965. Pizzas are a billion dollar business these days, but in the UK they’ve gone through various incarnations — from a novelty item adored by the upper classes, to fast food for children, to a gourmet dish worthy of heated foodie debates. But have you ever wondered about London’s earliest pizzas and pizzerias? What were they like? London's first Italian restaurant is believed to have been the Italian Eating House, just off Leicester Square, which was owned by Venetian Joseph Moretti between 1803 to 1805. The first published reference to an Italian restaurant in London, however, is in Illustrated Times in April 1856: "a French and Italian restaurant in Rupert Street, kept by one Louis Stucchi". It is highly unlikely, however, that either had pizza on their menu. Although dishes known as pizza have existed for centuries, the modern pizza as we know it evolved from Neapolitan flatbreads in the late 18th and early 19th centuries. 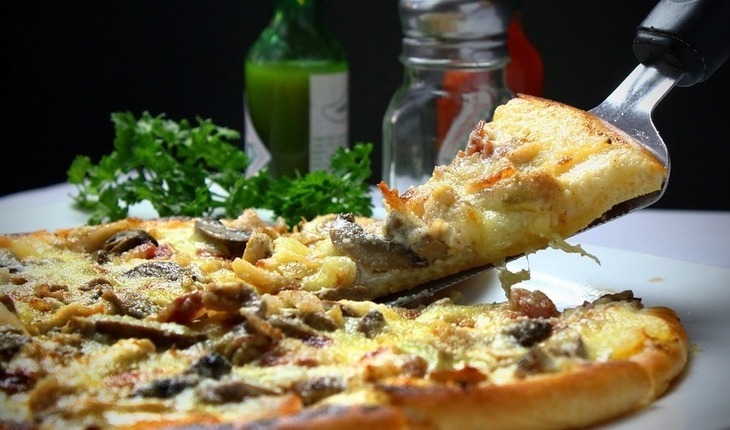 It was sold in market stalls and bakeries, until the world's first pizzeria opened in Naples in 1830. "The shoe box contained a crumpled piece of paper. 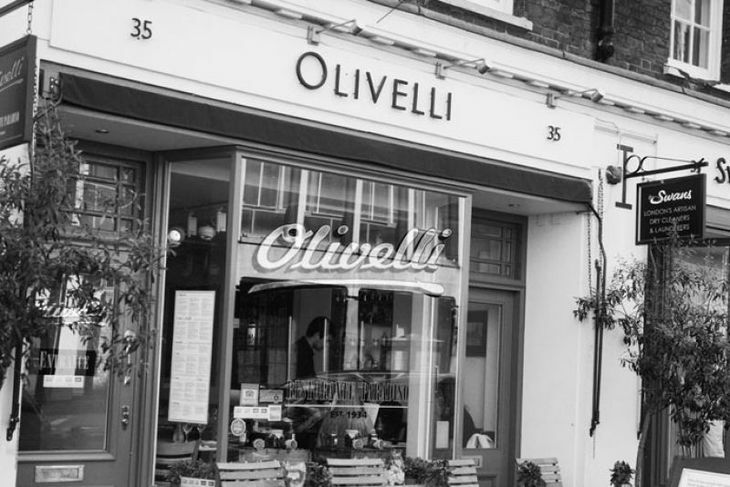 Written on it was the first evidence of pizza in London"
You may have eaten in – or walked past – the unassuming-looking Olivelli Italian restaurant in Store Street in Bloomsbury. It’s now a chain of four restaurants and a café – and it hides a secret. This flagship branch was probably home to London’s first pizza. "I came across a large, battered old shoe box hidden away in a dusty cupboard under the stairs. I was on the point of throwing it away when I realised it was packed with old photographs. The moment I started looking through them, I recognised great Hollywood stars such as the Marx Brothers, Danny Kaye, Bob Hope, Mae West, Mickey Rooney and Liberace. "The list went on and on. It was like the roll call of some of the biggest names in the entertainment business of the 30s and 40s, and what made it even more special was that all the photos had personal messages to Olivelli’s owners — Rita and Enrico Olivelli. Each one paid tribute to the Olivellis, their food and the restaurant's unique atmosphere." Photos of the original Olivelli's celebrity clients. Image: Olivelli. He had the photographs framed and displayed at the restaurant, where they remain to this day. Peter O'Toole, Roger Moore and Joan Collins had been regulars at the original Olivelli. 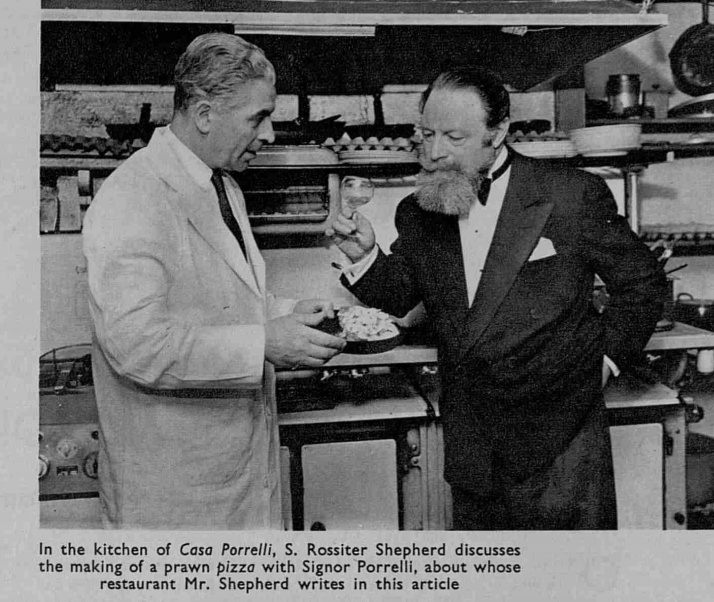 O'Toole told Salamone that the Sicilian-born Olivellis had bought the restaurant and adjacent hotel in 1934. There had been a café and patisserie on the ground floor, and a restaurant in the basement popular with actors and students from nearby RADA. One more thing. The shoe box contained a crumpled piece of paper. Written on it was the original restaurant's recipe for Pizza Margherita. This is the first evidence of pizza in London. "Very sadly, Giovanni no longer has the piece of paper with the original recipe on it. Some people dining at the restaurant asked one of the staff if they could see the shoe box... Later it was discovered that most of the contents, including the recipe, had been stolen." "Keep an eye open for… pizza, a baked sandwich in many varieties, sweet and otherwise"
Italian cooking has come in for a lot of abuse in its day, but mostly this is earned when it masquerades as French cooking – which it is rather apt to do in the cheaper Soho resorts. In its native land, it can be extremely interesting. If you want to get away from altogether messy dishes – and let us confess, most of them are – keep an eye open for… pizza, a baked sandwich in many varieties, sweet and otherwise. An advertisement for Brusa's appears in The Tatler, December 1955. Image © Illustrated London News Group. Image created courtesy of The British Library Board. Brusa's (St. Martin’s Lane, next to Coliseum). This is the place where they make a speciality of the round, flat, savoury pastry that lowered Mr Eisenhower's reputation in Naples a month ago: he had inadvertently said that he had eaten a better Pizza Napoletana in New York than in the Neapolitan capital. Brusa's is usually rather crowded, but highly Italian. So in a few months, pizza went from being "a baked sandwich, sweet and otherwise" to a Neapolitan speciality thanks to a presidential gaffe. A year later, attitudes towards pizza had changed even more. It's mentioned in The Tatler's society pages where, at a gathering of diplomats and minor royalty, "the hostess provided delicious Italian pizza" at "an informal supper party." London is fortunate in possessing a range of excellent and varying Italian restaurants… Brusa's Fifty Restaurant, in St Martin's Lane, offers Pizza Napoletana prepared in a specially constructed oven to ensure that this popular dish is properly presented, as it all too seldom is elsewhere. Towards the end of the 1950s, pizza was being mentioned in travel guides; pizza recipes cropped up in magazines (sometimes due to reader demand); it was flagged up as posh picnic food and dinner party favourite; and frozen versions appeared in the food halls of Selfridges and Harrods. 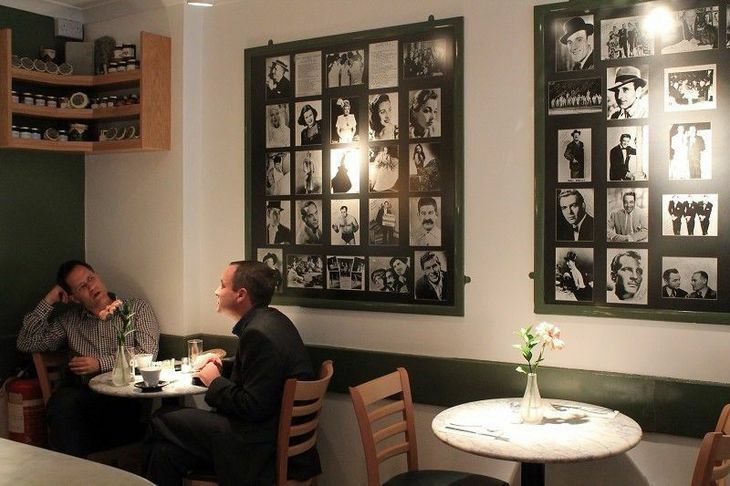 "He compromised by serving pizza with plastic cutlery and the coffee in paper cups but the hot cheese sometimes melted the fork"
Pizza Express in Wardour Street, Soho, mentioned at the start of this piece, was London’s first pizzeria. It was set up by Peter Boizot, who first discovered pizza in Italy in the late 1940s. A vegetarian since the age of six, it was "pizza's vegetarian nature" that attracted him to it. Later, in the mid-50s, he saw pizzerias springing up in Paris, worked his way through several of them in Rome, and visited many more in Germany. In his travels around Europe, he found pizzerias wherever American army officers were stationed. Boizot claimed that in the 1960s, London was the only city in Europe where it was difficult to find good pizza. He discovered pretty decent versions at London's first trattoria, the hugely popular Otello's in Soho, at Amalfi in Old Compton Street, and at Hosteria Romano in Dean Street. However, the choice was limited, and only those in the know asked for pizza. He walked out of many restaurants, disappointed and muttering to himself that the only thing to do was to set up his own pizzeria. This he did. First he found a restaurant called Romanella, which had a unique imported pizza oven, but had gone into bankruptcy. The oven was old, dirty and rusty – and Boizot promptly offered to buy it. His offer was rejected; so he went to Rome and bought a new pizza oven for £600. 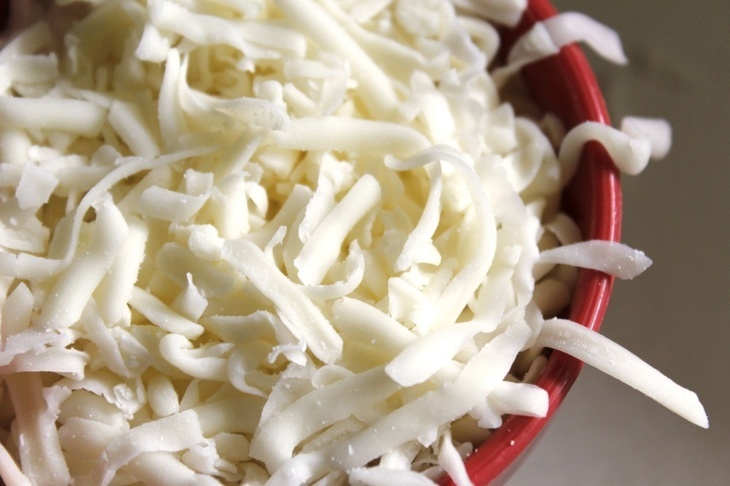 Back in London, he started looking for a site; and signed up the capital's only mozzarella maker to an exclusive deal. The cheese factory was owned by Margaret Zampi, widow of the late film director Mario Zampi who, by a stroke of coincidence… had been the owner of Romanella. Zampi had had a vision of launching pizza in England himself, and had even set up a company called Pizza Express, but died before his dream could be realised. Boizot bought the company and set about restoring the site in Wardour Street. But it wasn’t smooth sailing. Before he opened, his general manager and chef left; and a takeaway pizza hatch opened next door, selling frozen pizza and chips. Friends advised Boizot to sell chips too, or at least anglicise the pizza, but he insisted on authenticity. He employed an older female Sicilian chef, Gaetana, who helped make pizza in the first year or so, speaking little English. The restaurant was modelled on a type of popular pizzeria in Italy known as Pizza Rustica. Gaetana's open-view kitchen theatrics were popular with the diners who were assured of the pizzas' freshness – but business was slow to begin with. Its very reasonable prices and the West End's high rates meant it didn't make much money at first. Boizot wanted to minimise the washing-up, and emulate the chic bars of Rome and Milan by serving pizza by the slice on greaseproof paper, which customers would eat standing up. However, his friends convinced him that this wouldn’t work in England and persuaded him to install some seating. He compromised by serving pizza in disposable plates with plastic cutlery and the coffee in paper cups — but the hot cheese sometimes melted the fork. In the early days, Pizza Express had a ramshackle appearance, with small tables covered in fablon (colourful, patterned sticky-back plastic film). The early customers were neither foodie nor affluent, and often lingered without spending much money. A friend who was to become the financial brains behind the company suggested smartening up the place. So they started serving pizza "on the best Woolworth china", and eventually started making money. More branches followed in Coptic Street, Fulham Road, Notting Hill Gate, Hampstead and Dean Street. They — along with several dozen subsequent branches — were beautifully designed by maverick Italian designer, illustrator and cartoonist Enzo Apicella. He introduced squiggly artwork, bright paint, "Neapolitan-style pizza lamps", pizza counters and pop art, winning high praise. Londoner Leonard Joseph recalls dining at the new branch of Pizza Express in Dean Street in the 1960s: "After holidaying in Italy for the first time with my family (including three young children)… I took them there... It was a pretty realistic version of the pizzas we had had while we were on the northwest coast (Viareggio); and I vividly remember spotting a £5 note on the floor in front of the cash register which, once I had picked it up, paid for almost all we had eaten (some pasta included and probably a soft drink)." Boizot introduced live music in the newer branches, particularly the Original String Quartet which went on to win nationwide fame. The idea of combining pizza with live music was common in Europe and America, but was pretty radical and innovative in London in those days. It was inspired by Boizot's favourite pizzeria in Frankfurt, which had had a jukebox. In the late 60s, the Wardour Street restaurant was a regular gathering spot for the avant garde poetry set. Likewise, the Pizza Express in Coptic Street had regular classic music recitals. In both cases, it was the quality of the pizzas that had been the drawing card. The music at Coptic Street was a decision by the management, which was virtually unique. I knew some of the musicians who played there and went several times. People actually shut up and listened! 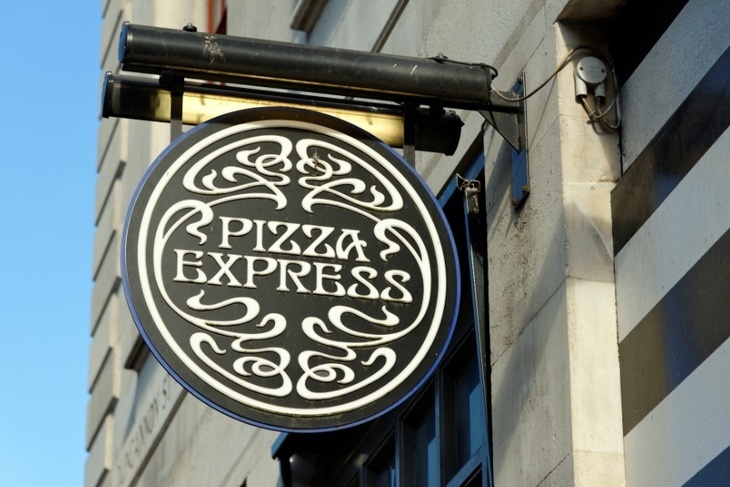 So Pizza Express, with its emphasis on cultural connections with Italy and its transformation of run-down buildings into stylish venues was a world apart from the standardised American, kid-friendly, junk-food pizza. Special pizza ovens have been mentioned a few times by now, but we don't know whether they were the all-important wood-fired ones. Restaurateur Alvaro Maccioni opened the first of what was to become 18-strong chain named Alvaro Pizza e Pasta in 1969. He is believed to be the first to use a traditional wood-fired oven, which led the food writer Egon Ronay to note in his Evening News column that "The pizza craze has hit London!" The night before the opening of his first restaurant, however, Maccioni's chefs had left the oven door open by mistake. The restaurant filled with smoke, and fire brigade had to be called in. They drenched the oven in water so it had to be rebuilt, delaying the opening. In 1970, the Pizzaland chain was opened by David Dutton, financed by Associated Newspapers (now DMG Media, home to Daily Mail and Metro). By 1973, Pizza Hut had arrived from the US. Pizza and pizza restaurants started going the same route as America, becoming cheap fodder – "plastic food in plastic environment". 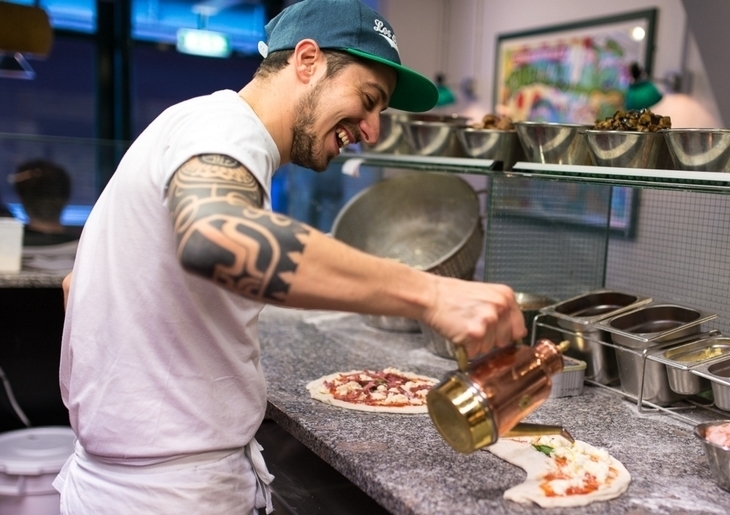 It took another 40 years before London’s pizzerias started going back to their artisanal roots, with the opening of a number of highly acclaimed pizzerias such as Franco Manca (2008), Santa Maria (2010), Pizza Pilgrims (2013) and many more. These new kids on the block take Italy as a starting point and boast fresh, locally-sourced ingredients, hand-made pizzas served in stylish surroundings and clued-up, adventurous diners. Just like Pizza Express did back in 1965.